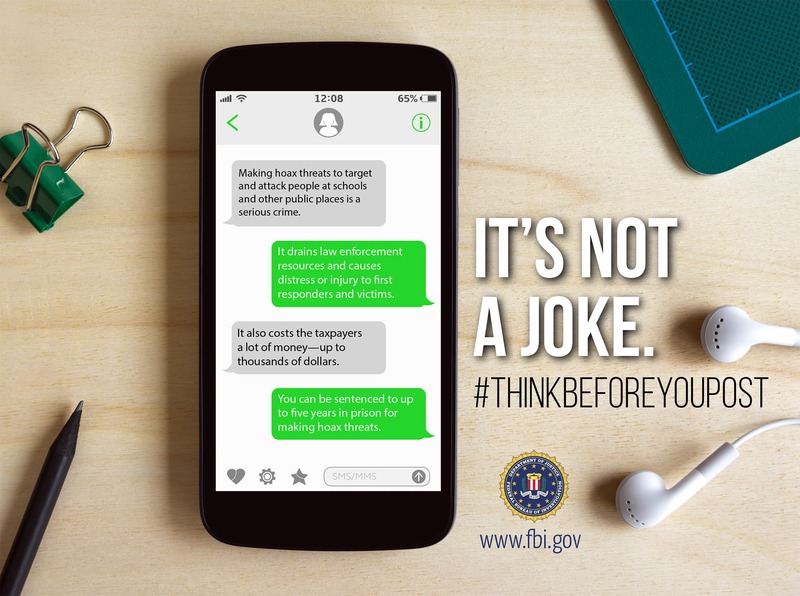 Using the social campaign #ThinkBeforeYouPost the FBI wants to warn all «pranksters» who wants «fun» online by sending threats to schools and other public places. If someone plans to send somewhere else about the threat she’s going to answer for it, warns the Federal Bureau of investigation. Such a joke can turn into Prancer not only a fine and imprisonment up to 5 years. Campaign from the FBI complements the actions of the police and school districts to identify threats to educational institutions. So, students of San Diego spread everywhere social ads: «Seeing anything, let» («If you see something, say something«), thus urging citizens to be vigilant and suspicious situations immediately report to law enforcement agencies. The campaign #ThinkBeforeYouPost in some regions will be placed billboards, drawing attention to the main message. False threats are very costly to taxpayers, depleting the budget of law enforcement agencies. That is why a significant role in the deterrence of threats about the FBI assigns a public. Early detection can prevent escalation of the situation, so at the slightest suspicion should contact the local police Department at 911 or contact the FBI by phone 1 — 800-CALL-FBI. Such a move, the FBI decided to resort because of numerous false threats that occur immediately after the tragic incident. So, a few months ago, we wrote that after the mass shooting in Parkland (FL), the FBI received over several weeks about messages with threats in the schools of new York.